Spinsters and Lunatics: Want a little preview of Bachelor Sheriff? Want a little preview of Bachelor Sheriff? 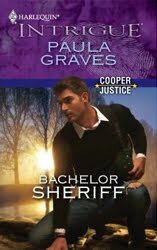 As most of you know, my fourth Cooper Justice book, Bachelor Sheriff, comes out this month from Harlequin Intrigue. The hero is the youngest Cooper brother, Aaron, who you met in the first and third Cooper Justice books. Aaron is a former high school football star turned deputy sheriff. When the story starts, he's recently been promoted to an investigative role after doing time on patrol and later on a joint DEA task force. The heroine, Melissa Draper, was a high school classmate of Aaron's. But if you're thinking high school sweethearts reunited, um, well, no. Melissa may have nursed a secret crush on Mr. Popular, but Aaron's memories of Melissa are a little hazier. Jasper's low whine jarred Melissa Draper awake. Blinking to clear the sleep from her eyes, she peered into the inky gloom at the foot of her bed, where the Beagle-mix puppy usually slept. But Jasper wasn't there. Her heart quickening, she sat upright. "Jasper?" She kicked off the bedcovers and shivered, surprised to find the room had grown frigidly cold during the night. From the doorway, Jasper whimpered softly. Melissa turned on the bedside lamp. Nothing happened. The digital alarm clock on her bedside table was also dark. The power must be out. That explained the cold. Outages weren't unusual where Melissa lived. Fallen tree limbs, lightning strikes—any number of events could cause a break in her power supply. She'd bought a gasoline generator last year for that very reason. She kept a flashlight in the bedside table drawer. She found it and turned it on. A beam of light sliced the darkness, bouncing off a light haze. Then the acrid smell of smoke hit her nose. "Come, Jasper." She grabbed her robe and entered the narrow hallway. The puppy kept pace as she headed for the stairs. As the smell of burning wood and plastic assaulted her in a bitter cloud, her heart rate soared. Now she could hear the faint shriek of the smoke detector going off downstairs. The hallway smoke detector went off right over her head, making her jump. Leaning against the wall, her hand over her galloping heart, she tried to think what to do next. The phone in her room depended on electricity, but her cell phone usually worked, even this far out of town. It was in her purse downstairs. She had to get to it. Gagging on the acrid haze, she crouched low and hurried to the top of the stairs. She paused there, peering down the steep stairs, her head swimming. She hated heights, even in full daylight when she could see each step down. With the bottom floor barely visible through the smoky haze, the dizzy sensation was that much worse. Clinging to the rail all the way down, she reached the first floor unscathed. The smoke seemed to be coming from the back of the house, near the kitchen. Had she left the stove on? She dropped to her knees, crawling through the thickening smoke toward her purse on the foyer table. Purse in hand, she groped her way to the door, reached up and twisted the dead bolt. She tugged at the dead bolt again, but the lock didn't turn. Beside her Jasper started to bark wildly, startling her. "It's okay, buddy, we're going to be okay." She could get out through the windows, breaking one if it didn't open. First, she had to stay calm and think, while she still had time. What could she save before the fire consumed it? Her pro bono files were in a metal file cabinet down the hall, but there were copies of those on disks in a safe-deposit box at the bank, plus digital copies of vital records on her laptop as well. The work files in the cabinet were just copies of files stored at the law office. There were some photos she didn't want to lose, but she wouldn't risk her life going back upstairs for them. Clothes, food and appliances could be replaced by the insurance check. All she had to save were her purse, her notebook computer and her dog. She swung the long strap of her purse over her neck and grabbed the attaché case containing her notebook computer. "Let's go, Jasper." Out of the corner of her eye, she spotted movement outside. Turning her head, she saw what might have been a shadowy figure disappear past the far window facing the front porch. She froze for a second, until a popping sound coming from the kitchen spurred her into action again. She dug her phone from her purse and dialed 911, reaching out to calm her frantic dog. "Jasper, shh…"
A female voice answered. "Chickasaw County 911." "This is Melissa Draper. I live on Tuckahaw Road, south of the bridge. My house is on fire." Reaching up, she tried the door again. The lock wouldn't budge. "I'm also having trouble getting out of the house." After a brief pause, the woman replied, "We've got units on the way. Is there a first floor window you can open?" Melissa peered up at the windows that looked out on the porch. The memory of the mysterious shadow gave her a moment's pause. Had someone set the fire deliberately? Maybe cut the power to the house? Was he outside, waiting for her? She'd have to take the risk. She pushed to her feet. "I'm putting the phone in the pocket of my robe. Just a minute." She swept the window drapes aside. Moonlight washed the front porch outside with cold blue light, dimmed by a light haze from the fire at the back of her house. From her vantage point, she saw nothing and no one moving outside. She unlocked the window and tugged at the sash. Decades of old paint put up a fight, but she finally heard a soft crack over the wail of the smoke alarm, and the window rattled open. She unlatched the screen and pushed it onto the porch. It fell with a soft clatter. "Come on, Jasper." She picked up the trembling dog and lowered him out the window onto the porch. Pulling up the hem of her robe, she crawled out the window in a hurry, hauling her purse and attaché over the sill with her. She landed with an awkward thump on the porch beside her frantic, barking puppy. "We're out," she said into her cell phone, her gaze sweeping the front lawn for any sign of intruders. All she saw was winter-browned grass spreading twenty yards square, hemmed by woods on both sides and the narrow lane in front. "You need to get away from the house. Head to a neighbor's house if it's too cold to wait outside," the 911 operator suggested. Melissa's Volkswagen GTI sat in the driveway, a safe distance from the house. She and Jasper could wait there. On her way to the porch steps, she paused by the door. Shining her flashlight on the dead bolt, she caught her breath when she spotted a small stick wedged into the keyhole. That's why she hadn't been able to unlock the front door. Had someone put the stick there on purpose? In the distance, wailing sirens broke the silence of the dark night. Melissa kept moving, clicking her fingers at Jasper and hoping he was unnerved enough by their current ordeal to follow her rather than haring off in all directions the way he usually did when he was off his leash. To her relief, he stayed close, hopping right into the car when she opened the door. The car's interior was frigidly cold, making her wish that she'd considered her warm winter coat one of the necessary things to save from the fire. She doubted the cold engine would generate enough heat to make a difference before the firemen arrived, so she didn't risk it, huddling close to Jasper, grateful, for once, to have his warm puppy breath in her face. A column of thick black smoke roiled from the back of her house. No flames visible yet, but a faint glow tinted the rising smoke and she tried not to think too hard about what parts of her house might be burning to the ground while she waited for the firemen to arrive. She checked the car door locks one more time. Someone had stuck that twig in the dead bolt. Might have been a prank, but what if it wasn't? If Jasper hadn't started whining when he did, she might not have awakened until fire had engulfed the entire house. The time wasted trying to open the sabotaged door could have been the difference between living and dying. (Full disclosure--I receive a commission for any sales resulting from the click-through). Text Copyright © 2010 by Paula Graves. Cover Art Copyright © 2010 by Harlequin Enterprises Limited. Permission to reproduce text granted by Harlequin Books S.A. Cover art used by arrangement with Harlequin Enterprises Limited. All rights reserved. © and ™ are trademarks of Harlequin Enterprises Limited or its affiliated companies, used under license. BTW, did you realize you won a free book from me on the Intrigue blog a little while back? I announced you as the winner but you never claimed the prize. So email me with your address and I'll send you a copy of your choice of my books. I don't normally send out new books (i.e., the ones people can still purchase new) but I can make an exception if you'd rather have one of the new ones rather than an older one. Click on the "home" link here on my blog and it'll take you to my webpage. Then click "contact" and you can send an email directly to me. I got it and hope to see you soon to sign it!